A midnight blue tuxedo is a perfect outfit for those men’s who love to appear different and elegant at every occasion. Mostly use to wear on weddings and formal meetings or programs. High-quality fabric is used for its construction to provide comfort and durability. Midnight blue tuxedos have become so popular in recent times that Proms and weddings are not the same without them. Everyone loves the spotlight and the never ending compliments about looking unique in a good way. That is why these tuxedo are so popular. It is the year of change and these outfits are the best example. Some say that these blue tuxedos (besides the vintage colored ones like black and white) were once in trend, but nobody had the confidence of wearing it as their wedding suit. As of now, these colored tuxedos have made their return in fashion. Today, a midnight blue work as a replacement for black and white tuxedos. Dressing aptly has never been more important than it is now. The men’s midnight blue tuxedo can certainly make you look like a superstar from the inside as well as from the outside. Tuxedos for men have always been classy and elegant. It is worn for Proms and other formal gatherings for this reason. You would always want to show off your best look to those who you will meet for the first time to have a good impression on them. HOW WAS IT BROUGHT BACK? Did you ever wonder how suddenly the tuxedos came back into popularity after being considered ‘not cool enough’? Well, there is the only man to give credit to, and his name is James Bond”. 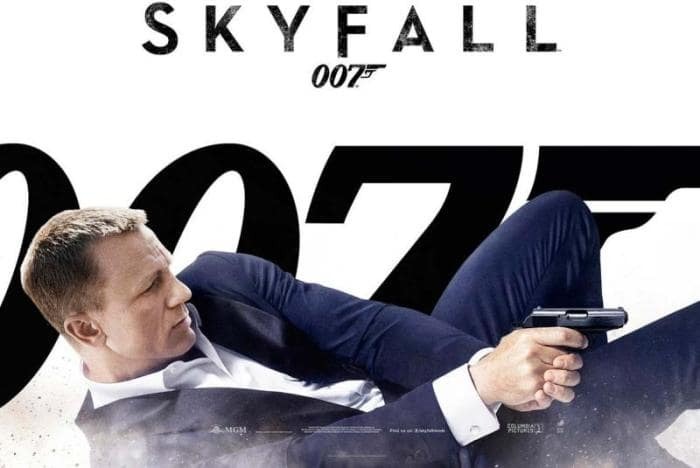 When these styles were thought to be too extraordinarily for the big events, and navy blue suits were ruling the formal clothing category for Prom, etc., the costume team of Skyfall decided to go for something unique as well. It is no surprise why James Bond movies are considered to be the pinnacle influence for formal wear. His suits are so expensive that you would need to save every dime for the next four to five months to own a James bond tuxedo. The movie was a huge hit, but bond tuxedo was a bigger success. This is not the first time that this elegant looking outfit was worn. Whether you're picking up a skyfall tuxedo, dark blue tuxedo or anything in between, it is important to know how it will work out for you? Is the color okay? Is it comfortable according to the weather conditions. Here are five things that you should note down for the next time you go shopping for a navy tuxedo. The very common mistake for first timers is that they pick the wrong color in a blue tuxedo. It is pretty obvious that there are higher chances of anyone getting confused between the shades. Shopkeepers will tell you many weird things that would be convincing to buy the wrong suit. Here is what you should do. Look at the above image. The is the darkest shade than the royal blue next to it. There have been many people, especially teenagers that often get fooled when they rent or buy it for Prom. Regardless of the lapel style, the Midnight Blue Tuxedo Wedding always resembles the night sky, similar to Tom Ford blue tuxedo. This applies to formal shirts for their wedding. A proper tuxedo shirt is as necessary as getting the right design. There are always two choices in this situation - You can easily go for the modern day shirt or you can for something more traditional. 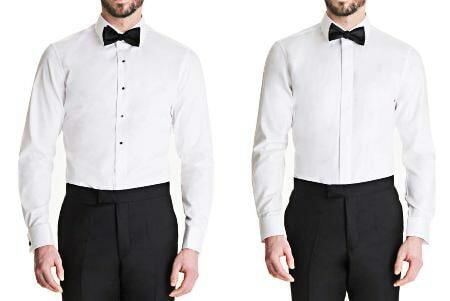 However, if you are going for a trim-fit tuxedo then wear a modern shirt, which you can see on the right here. Just make sure it is a trim fitting shirt to give you a sharp look. Nobody wants to keep straightening their shirt all the time and have creases on it. This is where your style gets interesting. If you owned a James Bond tuxedo before, have you ever worn a belt with it? If you have, you spoiled the whole purpose of wearing a tux in the first place. A belt is never worn on this form of outfit. 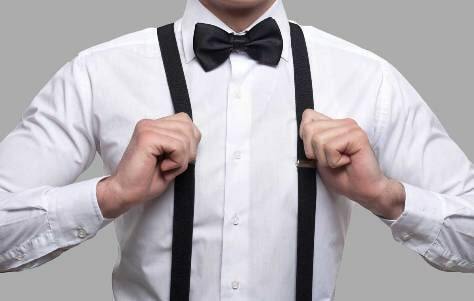 The best option is to go for suspenders. They do not have to be of a specific color but if it matches the james bond blue tuxedo, go with it. A darker shade of blue would be good enough. For the shoes, the most sensible choice and color would be to go with black. 007 tuxedo shoes are a slightly different from your regular style because of the shine they have on them. A sparkle in your step and you are not short enough for people to think your entire clothing is designed by great designers. We are in 21st Century, things need to be upgraded a bit. Instead of going for lace up shoes, you can choose loafers or something like what is in the image above. Lace up shoes is usually worn for suits, so it gives away that specialty in your dressing. 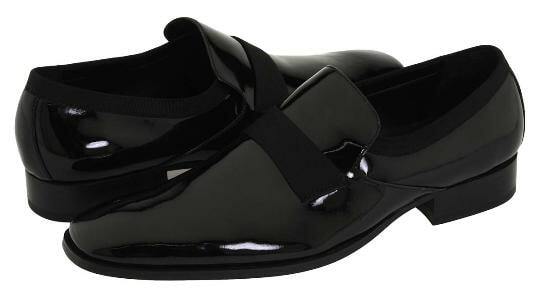 Loafers are a possible choice since it is being worn in semi-formal style as well. However, these loafers require you to wear them without socks. You got yourself a Tom Ford blue tuxedo jacket but need a trouser to go with. Or, you got two different colored formals and wondering how to mix it fashionably and get away with it. This is where your creativity comes in! A Midnight Blue Tuxedo Suit can be worn stylishly with a black trouser as well. It is not much, but as long as you are stepping out of the box with combination, it is good enough. Many people stick to the rules of not mixing anything up in fashion, but this is not a bad step after all. These are the five primary points that you need to see in selecting a Mens Blue Tuxedo. The style completely depends on you. However, a lot of men and young teenagers have been confused about there being a lighter shade. There are no lighter shades; they are simply selling you a slate tuxedo. It is good to be aware of these small things because it can happen to anyone. It is better to be safe than sorry, as the saying goes. Always make sure to go for the right navy blue tuxedo jacket. WHERE TO BUY THE BEST MENS BLUE TUXEDO? In this category, you will come across the finest suits for men. These are all well stitched with the most excellent materials so that you get a formal wear that can run for six to seven years, or even more. Tuxedos do take some time to make because of stitching it according to given measurements, but that does not stop it from delivering it on time. You should never over do your look because in a formal outfit like this, the more simple you are, the better is the outcome. If you want to look appealing to the eye and smart, shop one these Tom Ford tuxedo collection today. Also, get exclusive $10 OFF on orders.